Brewer Paramedic L'Easa Blaylock gives Camo oxygen after the dog was taken out of a home that caught on fire in Brewer Sunday. Firefighter Brandon Randall found the dog in the master bedroom of the home between the bed and the wall. 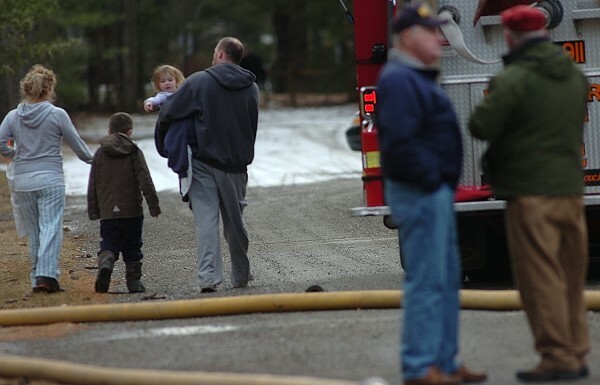 A young couple with children walk down Washington Street as Brewer firefighters put out the fire that damaged part of their home Sunday morning, Jan. 8, 2012. 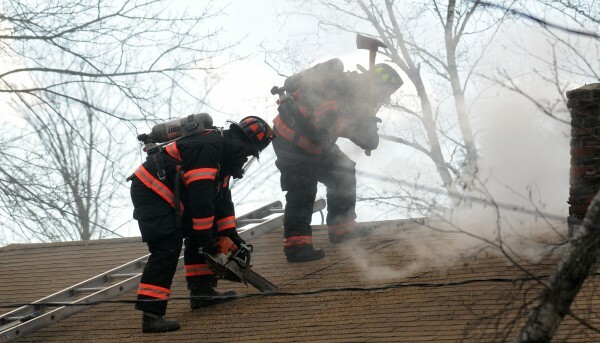 Firefighters cut a hole in the roof of the home to check on hot spots in the attic on Washington Street in Brewer Sunday. BREWER, Maine — Firefighters and emergency responders from all over the city headed to 269 Washington St. around 11 a.m. Sunday to fight a visible fire, and one rescued a dog from the building. A small beagle named Camo was found hiding in a bedroom, Firefighter Brandon Randall said while giving the pet some oxygen. Randall, an on-call firefighter, arrived about 15 minutes after other firefighters and “got the assignment to check the building for a dog,” he said. There was visible smoke when he arrived but the flames had been extinguished, the firefighter said. Brewer fire Lt. Mike Mullen said when the first group of firefighters arrived at 11 a.m. smoke was pouring from all corners of an attached garage and flames were visible. Firefighters were able to quickly extinguish the blaze and save the single-story framed house, he said. “It’s not livable” but “it’s repairable,” the lieutenant said. Assistant Fire Chief Chris Dore did an initial investigation into the cause of the fire, and the state fire marshal’s office is sending an investigator on Monday, Mullens said. A young couple with children were at the home when the fire broke out and all escaped unharmed, but they were unable to get the dog out of the house, Mullens said. The fire lieutenant spoke with the man, who said he has family living nearby, and was told about the dog trapped in the house. When Randall arrived, Mullens send him in to look for little Camo. 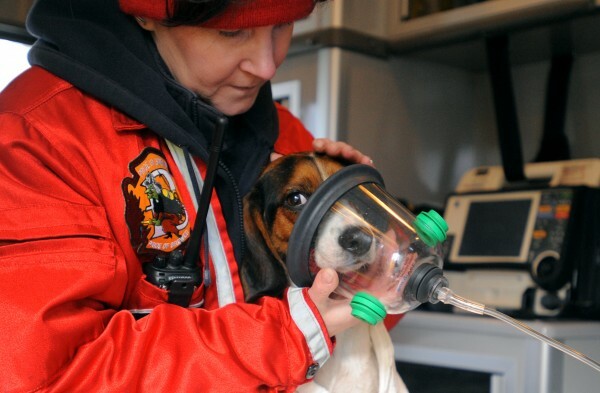 Brewer Fire Department purchased a pet oxygen mask kit in 2007 for $75. “It’s an oxygen mask just like the ones used on a person, but they’re differently shaped,” Fire Chief Gary Parent said at the time.